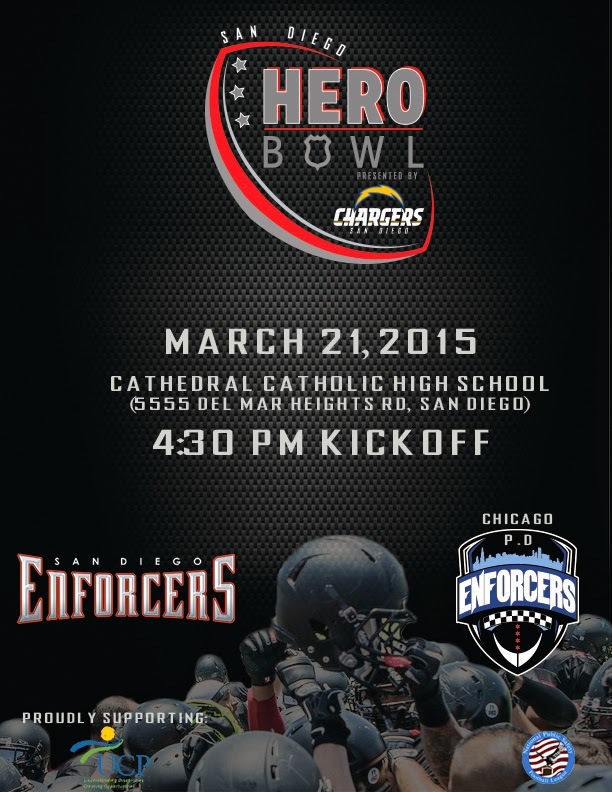 With a 33-12 season-opening victory at Bakersfield in the books, the San Diego Enforcers (1-0) will continue their pursuit of a second straight national championship appearance when they host the Chicago Enforcers (0-0) in the 9th Annual Hero Bowl presented by the San Diego Chargers. The National Public Safety Football League contest takes place at Cathedral Catholic High School, with kickoff scheduled for this Saturday, March 21st at 4:30 p.m. pacific time. It will be just the second meeting between the two teams. Like the rest of the NPSFL, both teams represent public safety agencies and play to raise money for local charities. This will be the season opener for Chicago, who is celebrating it's 10th anniversary. The 2011 NPSFL Division II champions finished last season with a 3-2 record, and was a game shy of taking San Diego's place in the national championship. Sixth-year head coach Greg Zaragoza comes to town with a career record of 15-10. 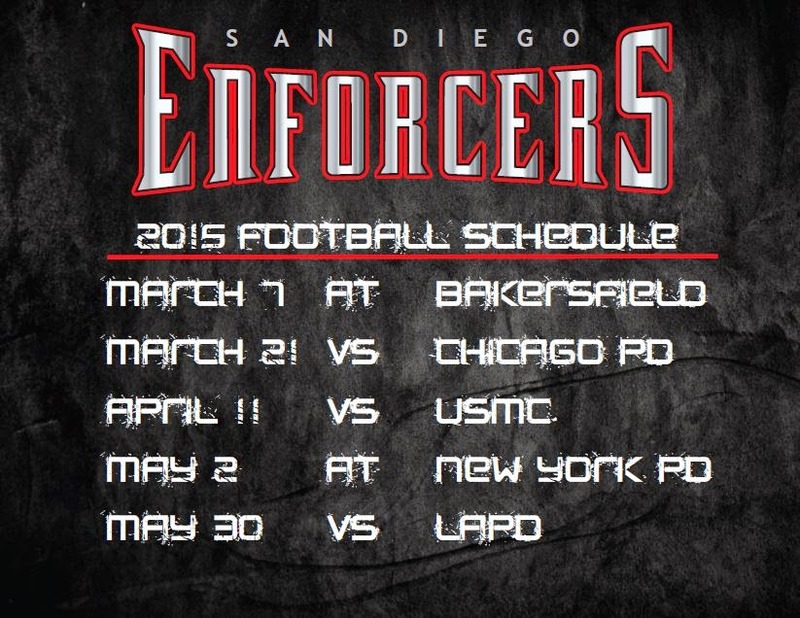 The San Diego Enforcers will be led once again by head coach Brian Salmon, who is serving the team for his 11th season. He'll be assisted by a staff of 14 coaches with ties to local high school and junior college programs, as well as numerous returning veterans. Among those veterans are quarterback JJ Carrell, running back Jahir Waterman, and inside linebacker Jason Burk. "You're talking about three players who definitely epitomize what the San Diego Enforcers are all about," said Salmon. "They're coaches on the field." Carrell began his ninth season by throwing three touchdown passes during the team's season-opening win. While he put up some impressive numbers, he understands that there's always room for improvement. "I thought we did well, we had some flashes of brilliance," Carrell said. "But we made some mistakes and will try to grow off them going into the next game." Waterman's field presence and break-away speed played a huge role in getting the Enforcers to the national championship game last season. While this team possesses many vocal leaders, the sixth-year running back would rather let his actions speak louder than his words. "The approach I took in the past few years is to try to keep my mouth shut for the most part, and just lead by example," Waterman said. "That's the leadership role that I take." "He's probably one of the top three running backs in the league," Salmon said of Waterman. "His conditioning and training program just reflects him, and when the other players see that, they're just going to follow." Following Saturday's game, the Enforcers get four weeks off before they host a team from the United States Marine Corp in a non-league match-up.